MUNCIE, Ind. 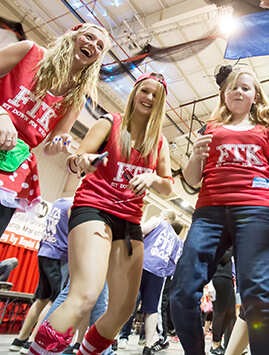 (February 20, 2014) – On February 22, more than 1,500 students will participate in the 7th annual Ball State University Dance Marathon (BSUDM), a 12-hour no sitting, no sleeping event that has raised more than $350,000 for the Palliative Care program at Riley Hospital for Children at Indiana University Health. The organization has shown significant growth the past three years, more than doubling the fundraising total every year. This year, BSUDM looks to improve on the total of $196,228.20 from 2013. The executive council has set a $250,000 goal and adopted the concept of the “Quarter Mil Thrill” for the kids at Riley. During the marathon, more than 1,300 dancers will hear live entertainment from musical acts like South Six Five, learn a line dance and listen to Riley families share their stories. The tagline “One Campus, One Cause,” has become an integral part of the organization’s marketing and social media efforts to unite Ball State students in support of Riley Hospital. Each year children from all 92 Indiana counties turn to Riley Hospital and its regional clinics more than 300,000 times as well as an additional 100,000 times in clinics and hospitals staffed by Riley physicians throughout the state. More than 10,000 of those patient visits involve families from Delaware and surrounding counties. 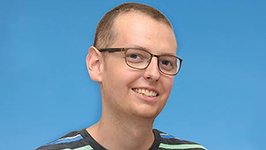 BSUDM have been among those inspired to contribute to the Riley Palliative Care program, and ultimately touch the hearts of many children and families. 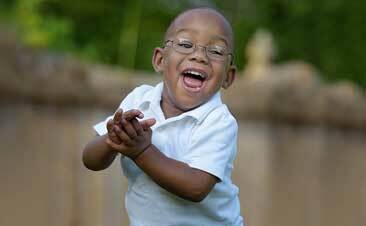 Palliative care provides specialized, family-centered care to meet the physical, emotional, and spiritual needs for children and families facing a life-limiting diagnosis. Crossroads of McKinley Ave. and Neely Ave. Donations can be made to BSUDM by visiting bsudancemarathon.org. BSUDM is a member of the Riley Dance Marathon program, the nation’s largest Children’s Miracle Network Hospitals affiliated dance marathon program. In the past six years, BSUDM has raised more than $350,000 for the children and families of Riley Hospital. They hope to raise an additional $250,000 at their 2014 marathon. For more information, visit www.bsudancemarathon.org. Riley Children’s Foundation supports Riley Hospital for Children at Indiana University Health, Camp Riley and the James Whitcomb Riley Museum Home. As Indiana’s only comprehensive hospital dedicated exclusively to the care of children, Riley Hospital has provided compassionate care, support and comfort to children and their families since 1924. Each year children from all 92 Indiana counties turn to Riley Hospital and its regional clinics throughout the state more than 300,000 times. Riley Hospital’s partnership with Indiana University Health and its strong affiliation with the Indiana University School of Medicine make Riley Hospital the leader in pediatric care in the state and the region. For more information, visit www.RileyKids.org.